There are lots of museums in Bydgoszcz. And lots of history. 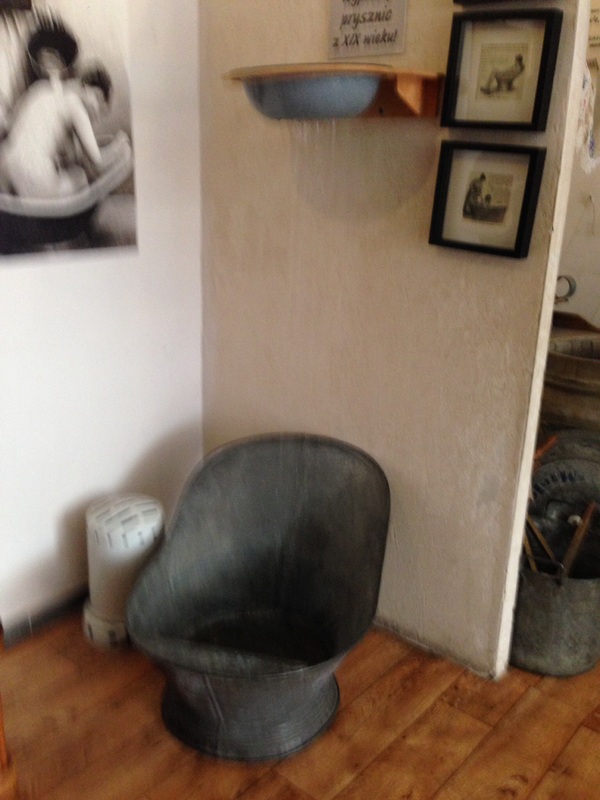 But perhaps the most unusual is the Museum of Soap and History of Dirt. 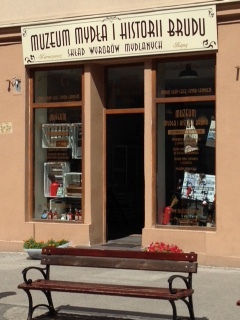 The museum is the only one of its kind in Europe and is located in Old Town. From the outside it looks like a charming little shop….but inside is a whole world of soap and dirt. A few Saturdays ago, David and I made the rounds of a few of the museums in town. We tried to go to the Museum of Soap and Dirt. It is listed as one of the “things to do”, but they didn’t have an English speaking tour guide on duty, so we scheduled a tour for the following day. So on Sunday after church we headed over to see what we could learn about Soap and Dirt. It was a nice little surprise to find out that we had our own private tour – probably because we were the only ones that didn’t speak Polish. The first part of the tour was to make our own soap! They have a soap making workshop in the back of the museum. 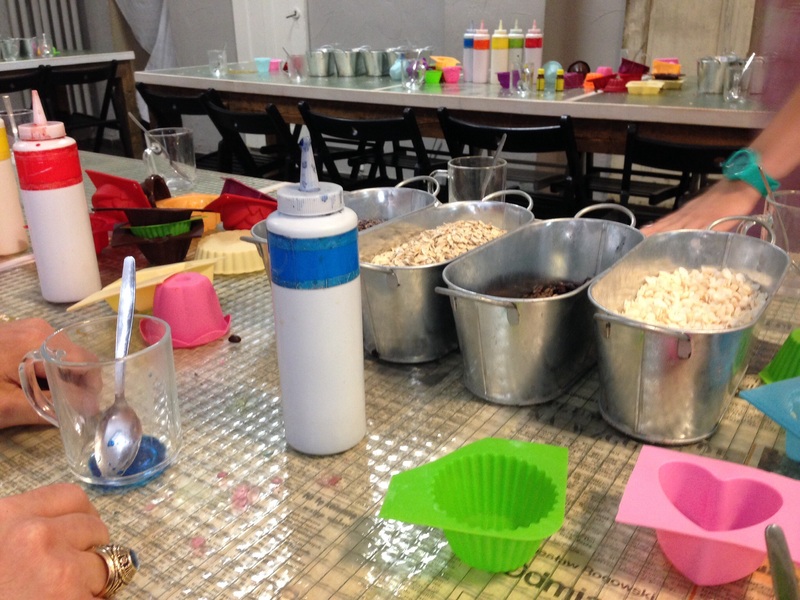 First you pick the shape/mold for your soap – stars, flowers, hearts, etc. 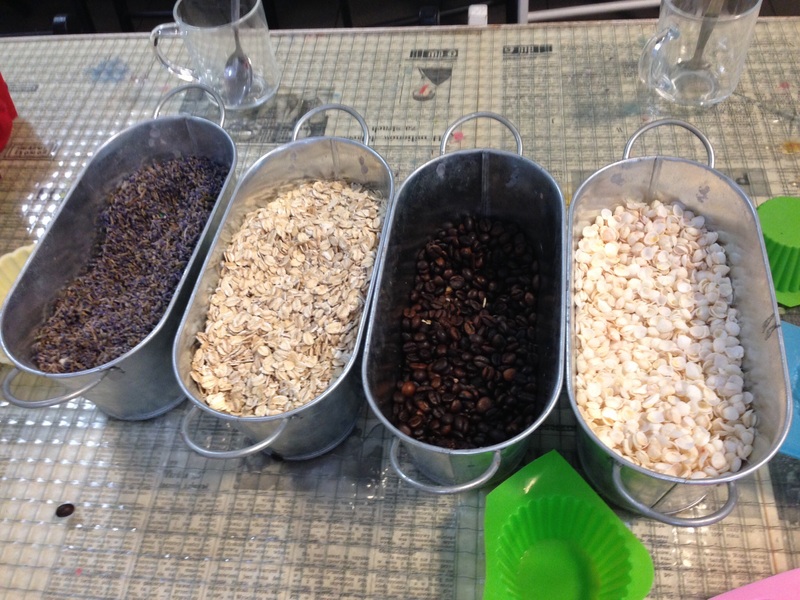 There were four things to choose from to add to your soap -dried lavender flowers, oatmeal, coffee beans or tiny shells. You can choose one or all. I chose one (shells)….and David of course chose them all! Then you pick the color and scent – mint, lilac, banana and vanilla (thankfully David did NOT pick all the scents!). 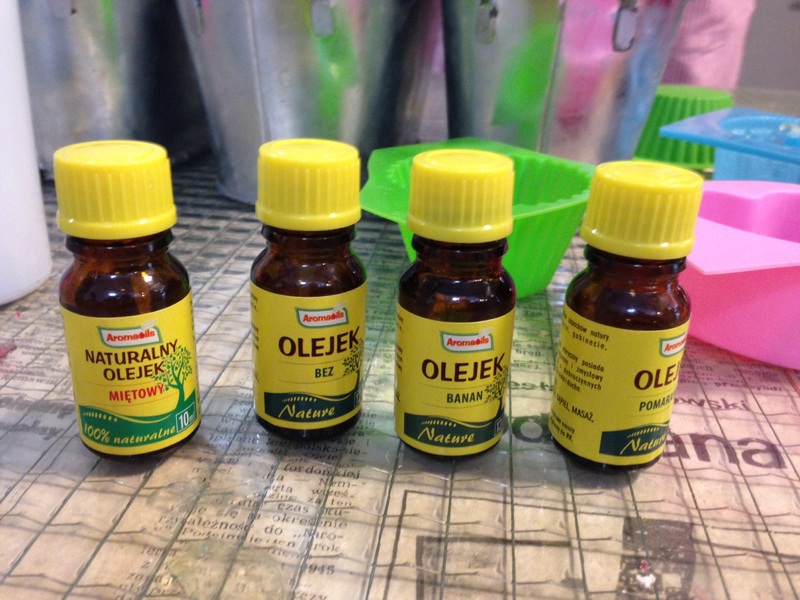 They pour hot glycerine into a small plastic cup and you add three drops of dye and a little of the scent, give it a quick stir (three times in each direction) and pour it into the mold. Then your soap is popped into a refrigerator to cool while you take your tour. Bathing (and soap) has come a long way from the ancient times when people rubbed themselves with oil and then scraped it off with a tool called a strigil (think of a small scythe). Just scraped the skin and dirt right off. It would take another 1,000 years before actual bathing as we know it today took place. How about this for a bathtub? Our guide actually had both of us get in….that was the way it was done in the old days. David and I are not “big and tall” and we were squished. When I asked how big people got in them, the explanation was that people were much smaller back then, than we are today. All I can say is they must have been pygmies. Men and women bathed together at public bath houses and not necessarily were you bathing with your own wife! Bathing was a social affair and lasted anywhere from 2-4 hours. You were fed meals and wine with the trays of food being placed over the top of the middle of the tub. 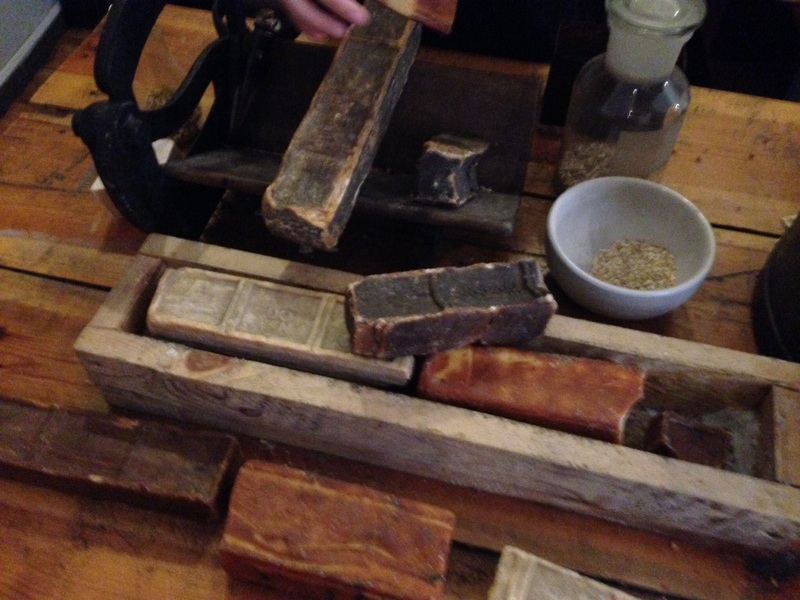 This is old soap….very old soap. Some of it over 100 years old. The darker the color, the older the soap. Still useable too! (although not recommended). 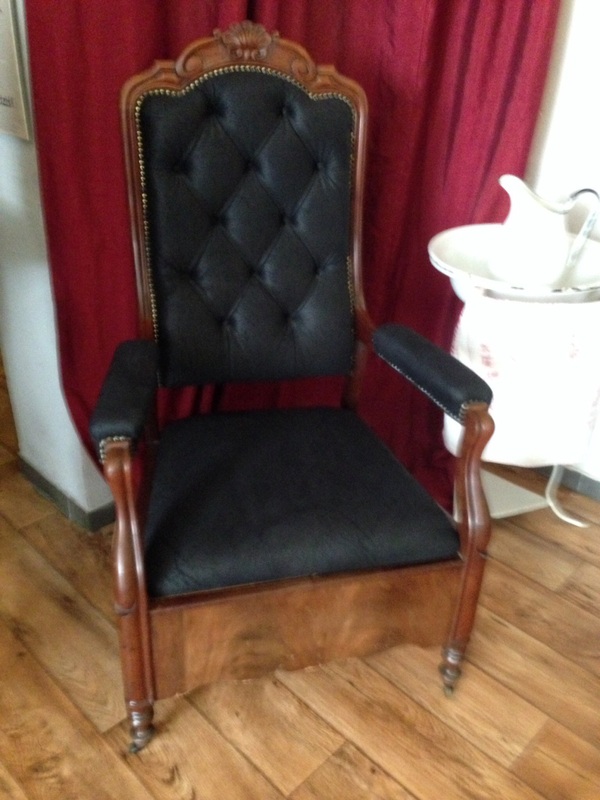 Want to know why chairs were called thrones? Because underneath the cushion was this! Didn’t even have to leave the room to go potty! The picture is a little blurry, (ahem…like some of the others) but it’s the first shower. Although maybe it’s blurry because I censored it due to the “nekkid” pictures on the wall. It was determined that having water poured over you helped eliminate germs. The pan that is suspended on the shelf has small holes in it. 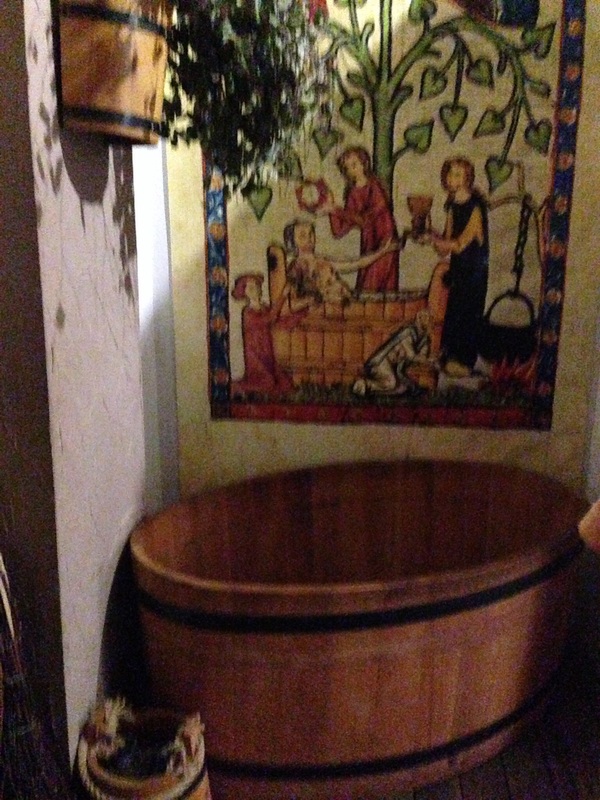 A pitcher of water was poured into the pan and then it would “shower down” on the bather sitting in the tub below. 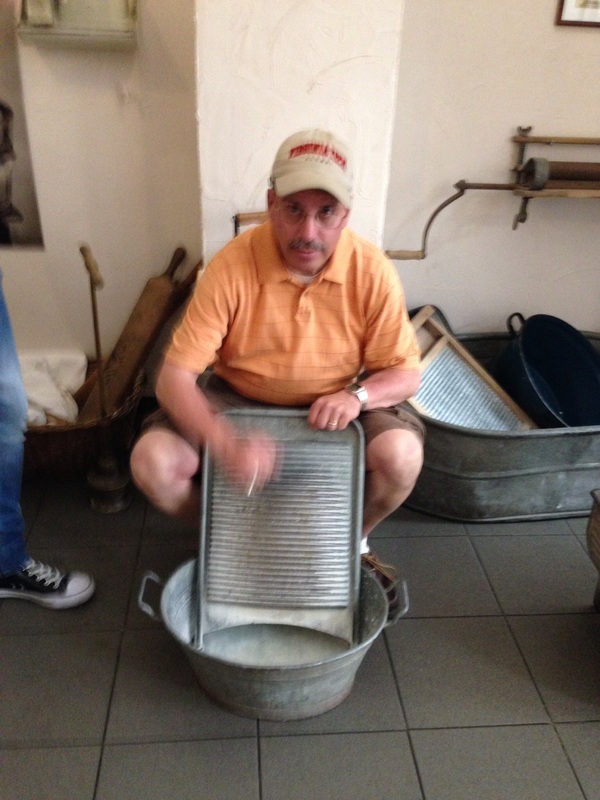 Here is David learning how to wash clothes….He’s doing it so fast his hand is a blur! It wasn’t unusual for people to spend 10 hours a day just washing clothes. 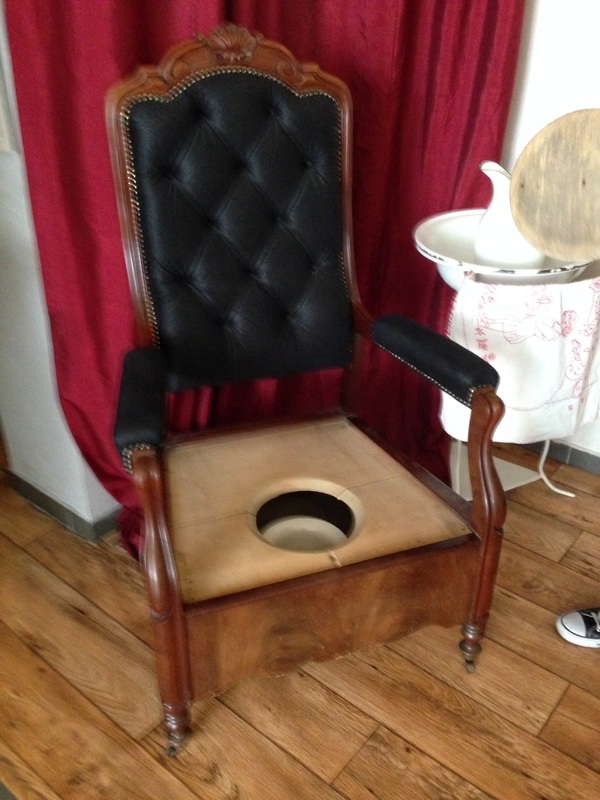 And soap was used for cleaning clothes….bathing wasn’t a priority way back in the day. In fact people would go for years without taking a bath….hence the need for LOTS of perfume to cover up the smell. Anyway…back to the laundry. Once you were finished washing, you had to iron (bleh!) The first irons were made of metal and had holes in the back for putting in hot coals. But since it was an open hole, the coal would fall out, get on the clothes and then you had to start all over again. 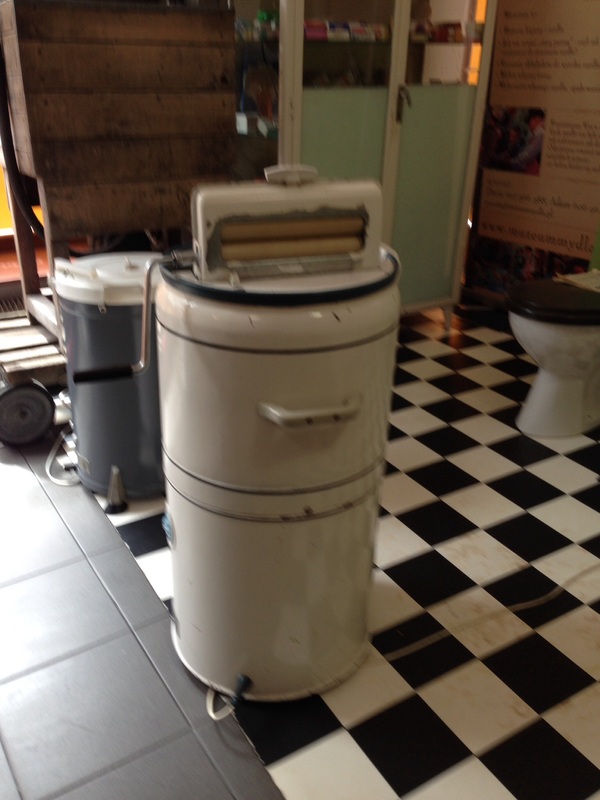 And how’s this for a washing machine. Only it wasn’t just a washing machine. It was also used as a still for making moonshine, as a butter churn, for making waffles, as a briner – all the better to make pickles with and many other uses. A true multi-function machine. It didn’t slice and dice, but I bet you could make pasta by running dough through the rollers! (ok, I made that up). They have some of the oldest soap every made there. Here is a little soap trivia for you: The first shampoo was invented in 1903 by a German chemist…but it was powdered and you had to add water. It wasn’t until 1927 that the kind of liquid shampoo We use today was first produced. Do you know where the name “soap opera” comes from? From a 1930’s radio series where the listeners were mostly housewives, and the advertisers were producers of soap and soap powders. Oh, and remember the soap David and I made at the beginning of our tour? Here it is! All nicely packaged up and ready to take home. Such fun adventures you and David are enjoying! Happy for both of you. The water comes out really slow…really, really slow. You’d be there forever! So interesting! Thanks for letting us vicariously experience your life in Poland.